A chopper, a secret reef, and a bucket of blood: ingredients for the perfect day on Hawaii’s Forgotten Isle. Access is a complicated concept. There’s physical access, the kind, say, a helicopter can provide, and then there’s the kind that only comes through personal connections. We needed both. The mission Private Air tasked photographer Michael Darter and me with: in one weekend, find and surf a prime break in Hawaii with no one else out, by any means necessary. We chose to accept it. The problem: The coastlines of the Hawaiian Islands are the most thoroughly wave-scouted and most consistently surfed in the world. What’s more, with the exception of Waikiki’s gentle rollers and a few other family-friendly spots, Hawaiian waves are among the world’s most jealously-guarded. The rules in the water are fairly simple — basically, locals have right-of-way — and are enforced via a range of nonverbal techniques, ranging from “stink-eye” on the mild side, to snapping the fins off an interloper’s board, all the way to an old-fashioned beating on the beach. Our first bit of luck was the decision to base this possible fool’s errand at the Kapalua Resort, a 23,000-acre golf paradise perched at the northern end of Maui’s west coast. Not only is Kapalua adjacent to Honolua Bay, Maui’s best-known surf spot, but the resort’s activities director, Adam Quinn, is extremely well-connected. We filled Adam in on our quest, and he directed us to Jimmy Buffett’s personal surf coach, the ponytailed, tanned and goateed Tim Sherer, surf tour operator and owner of the Goofy Foot surf school, 10 miles south of Kapalua in Lahaina, which in the 1800s was the capital of Hawaii and the center of the Pacific whaling industry. Tim gave it some thought and suggested we do something completely impossible via ground travel and extremely difficult even with a boat: surf a secret, nearly-inaccessible break on the cliff-protected north shore of Molokai,Maui’s rough-edged neighbor to the west. Upon arriving in Lahaina to plan the trip with Tim, the first thing we heard about surfing Molokai was the bucket story, which goes like this: A Maui local and a pro surfer based in Oahu decide to visit a secluded surf break on Molokai, sometimes called “the friendly island” but known to be less than welcoming to outsiders. They catch the ferry across the Molokai channel, rent a Jeep, drive to the end of the road, and hike down a valley to a point break on Molokai’s north shore. Five minutes after they paddle out, a local joins them in the lineup, paddling a longboard, on the nose of which sits a bucket. The outsiders, wary of Molokai’s reputation for a rough brand of foreign relations, brace for a confrontation. The local merely shows them a wide smile, picks up the bucket, and dumps its contents into the water next to our adventurers — five gallons of fresh cow’s blood. He puts the bucket back on the nose of his board, turns and paddles to the beach. As the visitors process what has just happened, the tiger sharks begin arriving, ending one of the shorter surf sessions on record. Access denied. After a frantic series of phone calls, we tracked down one of the operators of those ground tours, Singapore-born Clare Mawae, a former amateur world champion windsurfer. Clare, who speaks with a British accent but is as close to local as a haole girl can get, said she knew just the person we needed to clear the trip with. 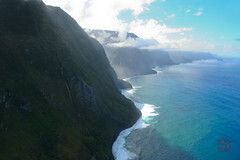 To land on Molokai’s hallowed ground, we needed permission and a guide. Throughout most of the developed world, permission is a concept that has largely been formalized and replaced by permits, issued by municipal authority. On Molokai, it’s still about getting permission. How valid that permission is, of course, depends on who issues it. In our case, that person turned out to be a local named Walter Naki. As long as Walter was on board, we would be fine, Clare said. Plus, if the first spot we hit wasn’t breaking, he could shuttle us to a better spot in his boat. With the surf guide and the helicopter already lined up, we waited breathlessly to hear from Walter. At 8:30 on the eve of our expedition, Walter called to say it was on. The next morning, Pilot Chris Reed of Alex Air met our crew — surf instructor Tim and his colleague John, photographer Michael Darter and me — at 7:30 a.m., at a community ballpark nestled in a eucalyptus grove in Fletcher Beach Park, next to Kapalua’s Bay Course. Behind him on the outfield was our ride for the day — a 6-seat American Eurocopter AS350 chopper. Because we’d be traveling over water for most of our trip, Chris had us put on some nifty life vests that are held in place by a belt and inflate when yanked off the belt and over the head. Since none of us knew the name or exact location of the secret spot, Chris asked for our guide’s phone number. Our guide’s niece answered the phone. We heard him say “A blue tarp? That’s it? I’ll know it when I see it? I need at least 50 feet in diameter to land - you’re sure there’s a clearing?” He got into the cabin shaking his head. We lifted off and Chris took us on a flyover of Kapalua’s legendary Plantation course, home of the annual PGA kickoff event, the Mercedes Open, the economic equivalent to Maui of having the Super Bowl in the same city every year. Then Chris turned the A-Star 180 degrees and we headed west over the Molokai channel. A northeastern swell battered Molokai’s shoreline as we approached sun-scorched foothills rising into the progressively greener slopes of the dormant Molokai volcano. The coastline sloped away beneath us into Halawa Bay, at the end of a verdant 2-mile long valley, and Chris pointed out the end of the island’s northernmost road. The chopper climbed to make it over the next ridge, and we expected another valley on the far side. Instead, Chris tipped the A-Star’s nose downward just as we topped the ridge, which turned out be a sheer cliff plunging 3,000 feet straight down into the Pacific. Chris had a quiet chuckle while the rest of us attempted to locate our stomachs. We skimmed westward along waterfall-ribboned sea cliffs until Chris spotted the blue tarp, just off a rocky cove where another valley met the ocean. There might have been a clearing near it at some point, but there definitely wasn’t one anymore - aside from few tent platforms lining the shore, it was jungle straight back to the walls of the valley. After dropping down to survey the landscape up close, Chris gingerly put the A-Star down on the “beach,” a 30-foot wide rock slope separating the jungle from the water. We stuffed our belongings and electronic gear into dry bags, attached them to ourselves with surfboard leashes, and swam out to Walter’s boat. Walter turned out to be a big, imposing, and — thank god — extremely friendly Molokai native, a black-haired grandfather who has been organizing private tours, fishing and hunting expeditions (under questioning, he allows that he’s bagged over a hundred wild pigs, mostly with a bow and arrow or knife), and generally running things on this corner of the island for the last forty years or so. The first spot we surfed was partially shielded from the swell, and for an hour Tim, John and I traded chest-high waves breaking over a sandy bottom. I could have stayed there all day, but it was clear that Tim and John were eager to ride something a little bigger, and Walter indicated that he had something else in mind for us. We paddled back to Walter’s boat, and he took us on a 10-mile run around the northeastern corner of the island. The boat ride alternated between relaxing and harrowing, as Walter piloted us between and over the 6-foot swells smashing into the foot of half-mile-high cliffs. Next to a spot where the wave only breaks when the swell is above 10 feet, Walter pointed out one cove called “the shower,” after a cliffside waterfall marked by the front half of a broken surfboard. We rounded the corner and headed south, toward Molokai’s only well-known break, Rock Point. I started scanning the shoreline for longboards and buckets. He did — a reef break a quarter mile from the nearest access point. For the next two hours, Tim and John had a field day ripping the chunkyleft-hand wave, and I squeezed in a few rides between wipeouts. The bigger waves in the sets were slightly overhead, and though the waves’ lips weren’t quite arcing outward to form tubes, we found ourselves in the midst of a minor miracle: riding a great break in Hawaii on a Saturday with no one else out. Even Laird Hamilton doesn’t get Jaws all to himself, but here the three of us were, dropping into wave after wave under Walter’s watchful eye. After the second session, exhausted, we docked Walter’s boat in a nearby cove and waded to shore near our designated pick-up spot. Two cars stopped immediately, their drivers offering Walter a ride to wherever he might be going. Before he headed off to a family luau, I asked Walter about the bucket-of-blood story. He laughed. It’s a great story, he said, but way too theatrical for Molokai. On Sunday, the sky opened up and drenched Hawaii in the most voluminous downpour it had seen in months. The clouds blazed with lightning, and flash floods shut down many of the islands’ towns. 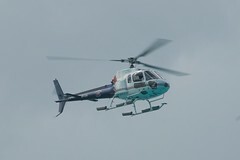 Roads were closed and Maui’s helicopter fleet was grounded. Had we delayed our trip by a day, it wouldn’t have happened. I waited out the worst of the storm in Hecock’s, an open-air sports bar overlooking the beach in front of Tim’s surf shop in Lahaina. The rain made the bar feel downright cozy as the New England Patriots and the Indianapolis Colts cracked helmets on TV screens above the tables. A barmaid joined several patrons for copious mid-morning cocktails while trading guy-trouble stories with a waitress. I kept an eye on the waves out front, and when the rain lightened a bit, grabbed one of Tim’s boards and paddled out. Despite the weather, the waves breaking at the Lahaina breakwall were attended by dozens of surfers, and I couldn’t help but pine for Walter’s secret spot on Molokai. One wave closed out on me and bounced me off the lava rocks below. I paddled past the impact zone, sat up on my board, and raised my knee out of the water – the reef had claimed a few stripes of skin from my kneecap. It wasn’t a 5-gallon-bucketworth of blood, but it was enough to send a message: unlike the unlucky surfers in the Molokai tale, I’d gotten what I came for, and it was time to go.